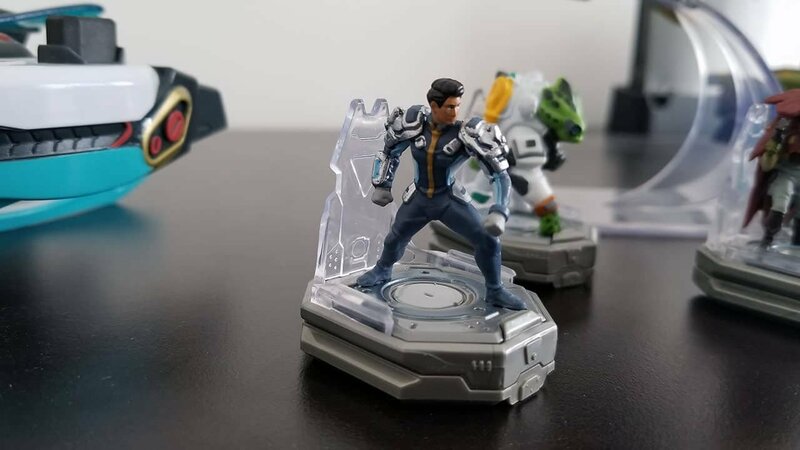 I find it very interesting that years after the toys-to-life craze was at its peak, Ubisoft is trying its hand at it with Starlink: Battle for Atlas. I have always been a fairly vocal proponent of the “Toys-to-Life” genre, at least in theory. I’ve always been fascinated by the concept of augmented reality, and I loved the idea of taking a physical object and plugging it into a video game in some way. And yet, no one has been able to progress the genre in any meaningful way. Sure, a lot of companies tried to get a slice of the pie while it was hot, but so far, each attempt to break into the genre—from Skylanders, to Disney Infinite, even Nintendo’s Amiibos, have been interesting, but short-lived. Starlink: Battle for Atlas is a notable attempt to keep the genre alive; a fairly interesting space-shooter/exploration game that does a lot of things right but trips over some familiar hurdles. Starlink tells the story of Dr. Victor St. Grand; a scientist who, while studying in Earth’s Arctic, discovers a crash-landed alien spaceship. Inside, he discovers a dying alien, whom St.Grand rescues and names “Judge.” In return, Judge teaches St.Grand how to make “Nova,” a powerful energy source that St.Grand uses to create the first faster-than-light technology. Upon doing this, St.Grand begins the Starlink initiative; gathering talented and unique humans to help him travel the galaxy and uncover the secrets of Nova. But the story is so much window-dressing to Starlink’s main attraction: The Gameplay. Similar to No Man’s Sky, it’s a combination of exploration and combat as you travel through the Atlas galaxy, discovering seven unique planets and taking part in fast-paced space and planetary dogfights. When not in combat, players will explore planets, taking on quests for local Electrum refineries—Electrum being the main form of currency in this game—or Observatories, to earn their loyalties, and gain a steady flow of cash and open up the world map respectively. But it’s not simple StarFox style action. Starlink: Battle for Atlas does have some RPG elements, as players can level up pilots, assigning skill points to certain abilities, and collecting mods for ships and weapons to give players an added edge in combat. But of course, the biggest part of the gameplay lies in the toys that accompany it, and this is the part I am most torn on. On the one hand, the ships are well made and feel good in your hands–to the point that I could honestly see kids just playing with these things around the house. And the concept works really well; snapping weapons on and off in a moment to change the fight is a breeze (although there’s little room to play casually as you’ll need a bunch of stuff laid out in-front of you). For the purposes of this review, I was able to try five ships, including the Switch exclusive Arwing, and while each one is designed differently—the Pulse being better suited to speed and maneuverability, while the Neptune can take and dish out more damage—ships mostly feel the same to control, by way of the game design. I found myself exclusively using the Arwing and never really having a problem, so it’s really a matter of preference, or which ship design you like best. Furthermore, the range of customization is pretty intuitive. Small touches like how a ship’s wings can be removed in place of weapons, or how both a ship’s wings and weapons can be attached upside down or backwards open a range of possibilities for ship design. On the audio/visual side, Starlink: Battle for Atlas performs beautifully on the Switch. While compared to the PS4 and Xbox One versions, players may notice a reduced amount of objects like trees or small details like water ripples; but for the most part, the game looks beautiful and runs smoothly. Planetary exploration takes place mostly in silence, however when battles commence, the music gets intense and atmospheric. Also, big kudos to the inclusion of the SNES Corneria theme when using Fox’s special attack which adds a delightful bit of nostalgia, while keeping the battle fast and fun. While the game is pretty fun, it’s not a perfect experience. There are some familiar trappings, analogous of a Ubisoft game that Starlink does fall prey too. Namely, the repetitive nature of gameplay as, even though planets are distinctive and uniquely designed, you’ll constantly be going to the same buildings, liberating the same outposts, rallying allies and participating in the familiar Ubisoft grind. While some gamers may enjoy this kind of gameplay, at times I felt it a bit mindless. A game with this premise would have benefited greatly from a more focused direction, or more player freedom–leaning into the No Man’s Sky comparison. Furthermore, space travel can be a bit of an annoyance as it never feels like you’re moving very fast across the galaxy, and Raider attacks happen incredibly frequently, so you’ll find yourself being forced to stop every five seconds to either get caught in a raider Hyperspeed trap, or avoiding the trap but still having to stop so the fight can initiate before you run from it. And I know it’s the main part of the game, but I find it a bit annoying that you can’t leave your ship when on a planet, especially when you’re diving into crashed ships or bunkers—making exploration of these tight areas a bit of a pain. Also, I feel it would have added more depth to the pilots themselves, giving them unique weapons and ways for exploration, adding more reason to have separate, physical additions to the roster. At the start of this review, I added the, “in theory” caveat to my support of the Toys-to-Life genre, because it really is something—thus far—that has been better in concept, than in application. Starlink’s implementation of Toys-to-Life is incredible. The idea of plugging in different pilots, each with unique abilities and skill trees; different ships, each with unique designs, and different stats; and attaching different weapons, some with unique element-types that are required for certain enemies, or activating certain items, adds a lot of depth to the gameplay. However, it must be noted that these things come with a pretty steep price tag, that may alienate potential customers. The Starter Packs, which includes the game, a ship, a pilot, and three weapons retails at $99.99 CAD, which may seem standard for most video games; however, sold separately, ships retail for $39.99 CAD; while pilots go for $12.99 CAD, and weapons for $14.99 CAD. Now some may argue that it’s simply optional, and you may only need one ship to get through the game so you can just choose one you like and stick with it; or that the Starter Packs include fire and ice weapons so at least the main bases are covered; however, the fact that customization and variety can come with such a hefty price tag, may deter parents who are purchasing this for their kids, or gamers who simply can’t afford to get all the cool stuff this game is offering. And the real kicker is none of the toys are even required to play the game. Starlink has both a physical and a digital edition, the Standard Edition priced at $79.99 CAD, and features five ships, 12 weapons and seven pilots (which includes the StarFox expansion) ; the Digital Deluxe edition is priced at $106.49 CAD and features six Starships, 10 Pilots, and 15 Weapons (again, including StarFox). Individually, digital content is sold at a reduced cost, but you’re still going to pay $19.99 CAD for a pack that includes a pretend ship, pilot and weapon. It’s a little absurd. Granted, the inclusion of digital content does make sense for a system like the Switch where playing in Handheld Mode is a factor, and the necessity of physical attachments would be impossible. In that vein, I spent most of my time playing it on the dock for maximum immersion, although I will say the game does run really well on handheld, and with everything available digitally, it does feel like a vastly different kind of game. However, those issues aside, Starlink: Battle for Atlas is a well-made, and fun to play game. I did enjoy my time with it, though I do wonder how my experience would’ve been as a consumer, and not a critic who was given all the available content. While I think there is a lot to enjoy here for both kids and adults alike, I do worry that the price of the content does raise the bar for entry significantly. If for nothing else, it’s certainly more a StarFox game than StarFox Zero ever was.